Unlike our typical “I Had the Burger” hiatus, the lack of blog posts in recent months isn’t due to laziness (well, at least not entirely). This time, I have a valid excuse. I moved to the grimier, more expensive Portland South (i.e. San Francisco). I enjoy my new city, but in my transition, I find myself wistfully dreaming of Portland’s wonders: fresh air that doesn’t smell like a mixture of urine and bubonic plague, perfectly curated apothecaries that all look exactly the same, a booming artisanal beard oil industry, obsessively complaining about the onslaught of high rises ruining “Old Portland”... One morning as I commuted to work in a sardine-packed train where I likely contracted tetanus and/or lice, I began to feel a bit homesick. But then I realized, it wasn’t homesickness – it was hunger. While San Francisco brings me a higher amount of vitamin D, I am severely lacking the more important nutrient, Vitamin B(urger). I knew in my heart I couldn’t live with myself if I missed Portland Burger Week, so I booked myself a flight back to Burger City, U.S.A. After all, I couldn't miss the most important week in my life! The week leading up to Burger Week was chaos. I didn’t have time to properly research the list and plan out my spreadsheet to my preferred amount of detail, leaving me with holes in my schedule, and a lack of burger knowledge. I also have a limited number of vacation days left, so I missed out on two full days of burger potential. It’s almost as if no one understands the gravity of the situation. Although my burger brain wanted to drive straight to the nearest Burger Week spot, my conscience made other plans. When I lived in Portland, I volunteered as a food preparer for an older woman who was unable to make her own food. It was her 90th birthday, and all she wanted was to go to her favorite restaurant Papa Haydn’s for lunch. I went straight from the airport to go meet her and celebrate her birthday. Papa Haydn’s is not a Burger Week location, and so I decided to save face (and also stomach space) by only ordering an appetizer. 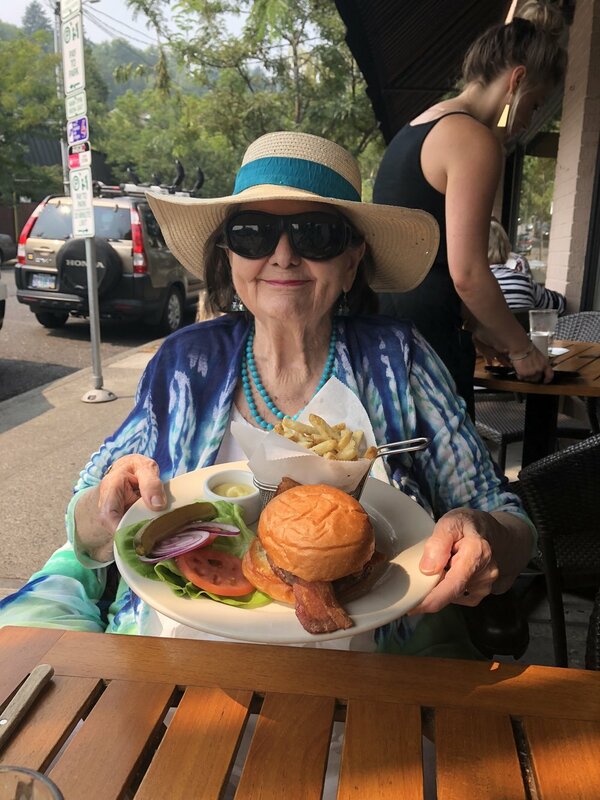 My 90-year-old friend Dolly, eating a burger that is not a Burger Week Burger. Since I already missed two days of burgers, I found myself in a fit of anxiety. I drew a helpful chart to express my burger panic, seen in Figure A.
I had to find the nearest burger to ease my worries. I settled on Kim Jong Smokehouse, since it was on my list and in close proximity. 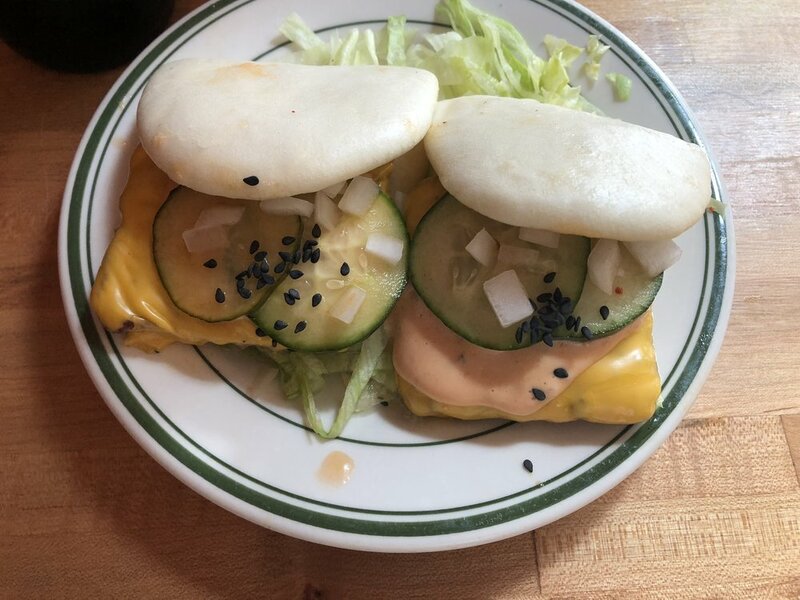 The Kim Jong Smokehouse “Cheeseburger Steam Buns” are exactly what they sound like… Cheeseburger Steam Buns. It’s a burger patty, American cheese, special sauce, sesame bun, cucumbers, shredded iceberg lettuce, and (you guessed it) steam buns. Kim Jong Smokehouse "Cheeseburger Steam Buns"
The steam bun portion was delicious, but they were going for an Asian/Big Mac fusion and it just wasn’t working for me. The cucumbers gave it a limp texture in an already soft burger experience. It’s always difficult to properly rate the first burger of Burger Week, but I’d rate this one a 6.5. I had plans to crash my old Dungeons and Dragons campaign (nerd alert) at 5:30pm, so I had a bit of time to kill between my next burger, so I met up with a few old coworkers at a bar while they had a work offsite. However, it turns out “New Portland” is full of extreme rush hour traffic, leading me to miss my scheduled 5pm burger. I tried to calm myself with the mantra, “It’s only day one, there’s still time.” After all, I planned to meet my dad for dinner later that night. I tried to ignore the Burger Panic that was now close to skyrocketing off the charts. My parents have never experienced Burger Week, so I thought I would take it slow and introduce them to a burger near home so they could ease into the pandemonium that is Portland Burger Week. I assumed Aji Tram would be an easy burger to get, since no one from Portland ever treks to the suburbs unless they’re having a chain restaurant craving, or there’s a sale at the strip mall. But when my rental Toyota Camry rolled into that parking lot packed with Lake Oswego luxury cars, I knew I was in for trouble. And then I saw it – the three words that define Burger Week demise: “Burgers Sold Out”. I call my dad in a rage-induced panic. Like the scene in Taken when Liam Neeson calls his daughter’s captors, I bark firm verbal instruction at him: “Change in plans. Meet me at Next Level.” Click. I peel out of the parking lot, and speed away. BURGERS, I WILL FIND YOU. AND I WILL EAT YOU. The Next Level in Lake Oswego is actually part of a Whole Foods, so… there’s that. It’s also strictly plant-based, so… there’s that. For the long time followers, you know I have a certain qualm with vegetarian burgers, but in pure desperation, I leave my cynicism at the door. After all, they almost made my top 3 during Burger Week 2016. The Next Level “Peachy Portland” has a grilled peach, melted provolone, caramelized onion, red leaf lettuce, and smoked peach aioli. It fell apart as soon as I bit into it, and after multiple attempts at putting it back together, I gave up. I’m not sure what the patty itself was made out of, but overall something just wasn’t right… I didn’t feel like the provolone worked well with the peach, and the sauce felt confused. Overall, I gave it a 6. I ended the day feeling a bit disappointed. I still didn’t have a secured plan for the rest of burger week. I only had two burgers, and both were under the average 7 rating. Honestly, it feels like it's been so long since I've had a burger, maybe my tastebuds are out of whack. Maybe I don't even know what a burger is anymore. Is it me? Am I a rusty, washed up has been? Am I no longer a Burger Kween? So far, it feels more like Burger Weak. We can only hope tomorrow is brighter. (“Burger Weak” copyright Pat McCaren. He always gives me a good one-liner and deserve the recognition). 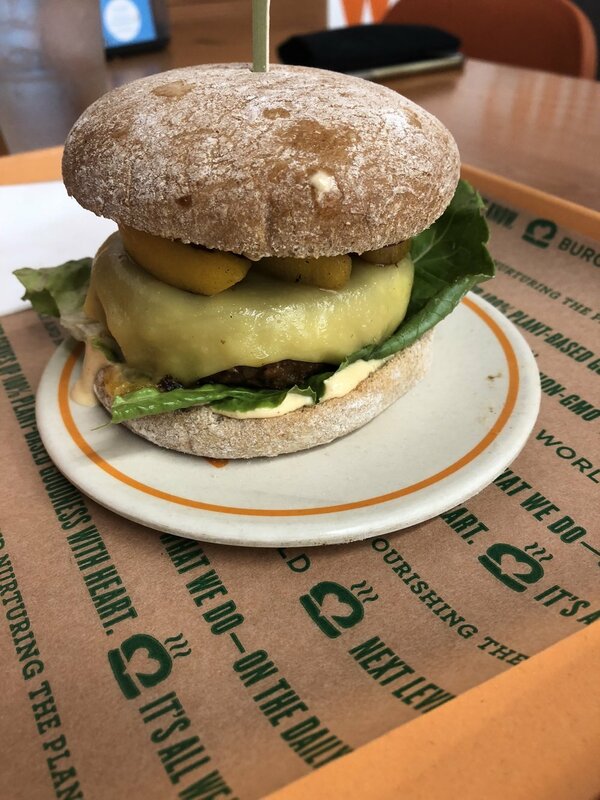 Older PostPREVIEW: BURGER WEEK 2018 IS HERE!